Washington: The US Federal Reserve is unlikely to raise key interest rates this week or unwind emergency support as the economy starts a tough recovery from recession, analysts say. 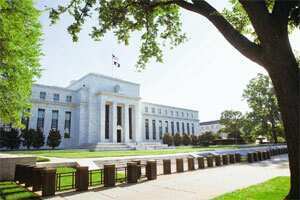 Fed policymakers were expected to hold the base lending rate at near-zero and maintain a trillion-plus dollar programme to underpin the recovery at the conclusion of their two-day meeting on Wednesday. Economists and traders will be poring over the Federal Open Market Committee (FOMC) statement released after the meeting in search of signals for the direction of monetary policy. The FOMC meeting comes after official data showed last week the economy grew for the first time in a year in the third quarter, ending the worst recession in decades. The stronger-than-expected 3.5% expansion in gross domestic product (GDP) likely will slow in the fourth quarter as government support measures wind down and unemployment continues to rise, economists say. With nearly 10% of the labour force out of work, consumer spending—the main driver of the US economy and key to a sustainable recovery— remains challenged. FOMC has held its federal funds rate target at zero to 0.25% since December in a bid to help kick-start the economy out of the worst downturn since the Great Depression. Federal Reserve chairman Ben Bernanke recently signalled there was no hurry to tighten monetary policy, saying action would be taken “when the economic outlook has improved sufficiently". The Fed often waits at least several months after unemployment, a lagging indicator of recovery, peaks before beginning to raise rates. “The markets will undoubtedly look beyond the actual interest rate announcement, and focus instead on the tone and wording of the actual communique," said Millan Mulraine, analyst at TD Bank Financial Group. “In this regard, we expect the economic outlook to remain largely intact, with the Fed reiterating the improved outlook for the US economy, reflecting in part the encouraging tone in the recent economic reports, and in particular the policy-induced surge in GDP in Q3," he said. Economists underscored that inflation continued to be tame amid the fragile recovery, well within the Fed’s comfort zone. “The inflation outlook should also remain unchanged, with the committee noting that it expects inflation to remain ‘subdued’, on account of the ‘substantial resource slack’ and stable longer-term inflation expectations," Mulraine said. The unemployment rate hit a 26-year high of 9.8% in September, according to the latest official data, and is expected to reach double digits in the coming months. The US government reports October labour data on Friday, with most analysts expecting the jobless rate to rise to 9.9%. A Fed staff projection used by policymakers at the 22-23 September FOMC meeting showed unemployment holding as high as 9.25% by the end of 2010 and then falling to about 8% by the end of 2011. Moody’s Brusuelas predicted the FOMC statement would conclude that conditions will likely “warrant exceptionally low levels of the federal funds rate for an extended period", a phrase he noted had been in every statement since March. “But the Fed may be ready to tweak it soon, which would be significant," he said. “We will be watching to see if the Fed adjusts its commitment to keeping rates low for an ‘extended period’, which may signal the central bank will remove some monetary stimulus earlier than anticipated." Such a minor change to the Fed policy outlook could provide support to the depreciating dollar, while appeasing inflation hawks, he said. Some central banks have begun raising interest rates, such as Australia and Norway in October, putting additional pressure on the dollar. “So far, I am reluctant to assume that the Fed will raise policy rates in response to this pressure. The magnitude of imported inflation, while not minimal, is small," said Donald Ratajczak at Morgan Keenan.